One busy town affected by Ebola is at the crossroads of three nations. "Ebola, out! Ebola, out!" Those are the words children chant in unison after school in the Wangata district of Mbandaka, in the Democratic Republic of Congo. Mbandaka is one of three areas affected by an Ebola outbreak in the central African nation and the focus of Ebola response efforts, since it's a hub in the region. Boats with passengers and goods travel to and from the city on a daily basis. Neighboring countries lie just across the busy Congo River. Three people in Mbandaka have died from Ebola disease in the past few weeks and more than 400 people are being monitored because they are believed to be at risk. "There’s been quite a massive response immediately," Leah Feldman, an American nurse working for Doctors without Borders told ABC News. "Whereas what we saw three years ago, there was quite a delay in the international response. Now there are many groups on the ground, many people working together and I think that’s what, hopefully, will help us to stop this outbreak as quickly as possible." The two other areas affected by Ebola, the towns of Bikoro and Iboko, have seen more cases -- 22 and 24 respectively -- but have fewer people passing through. (Louise Annaud/MSF/EPA via Rex/Shutterstock) Doctors Without Borders team treat patients in an isolation area at the Mbandaka hospital in Equateur, Democratic Republic of Congo, May 20, 2018. Ebola is endemic to the region. The virus was first discovered in the Congo in 1976 and there have been nine cycles of outbreaks since, including an outbreak last year lasted about 40 days. More than 11,000 people died during an Ebola outbreak in West Africa in 2014. In this latest outbreak in the Congo, 51 cases of suspected Ebola have been reported so far, according to the country's health ministry. Of those, 35 are confirmed Ebola cases and 13 are considered probable. At least 25 people have died. The approach to treating and stopping this outbreak is different because health workers are innoculating people with an experimental vaccine, using a ring vaccination approach, in all three affected areas. The vaccine was used in Sierra Leone and Guinea in 2015 and has proven to be safe and effective. Hundreds of people who either know someone affected by Ebola, or know someone who knows someone else, have received shots so far -- including health workers. 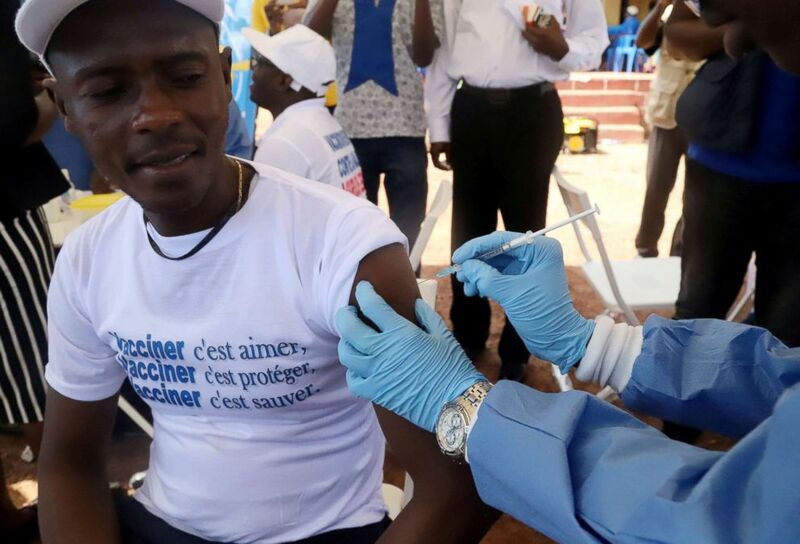 (Kenny Katombe/Reuters) A World Health Organization (WHO) worker administers a vaccination during the launch of a campaign aimed at beating an outbreak of Ebola in the port city of Mbandaka, Democratic Republic of Congo, May 21, 2018. While the vaccines could be a game-changer, experts caution that other measures are also important. Checks have been set up at airports and ports in key towns across the country. In Mbandaka, the focus at the moment is actually convincing people to fight Ebola. Outreach teams are going house to house, talking with Church leaders and other community representatives, to raise awareness about the virus and the importance of precautionary measures. What happens in the region matters because Mbandaka is located by Congo River -- the second longest river in Africa -- which is connected to the capital Kinshasa and to neighboring countries. While the outbreak is not considered to be an emergency of international concern at the moment, the risk of propagation is considered high at both a national and regional level. All nine neighboring countries have been placed under alert and advised to implement safety measures. Researchers in the Congo are working on identifying the cause of this latest outbreak, but one probable transmission source is bushmeat. In Mbandaka, like in many other areas of the country, people eat monkeys and other types of bushmeat on a regular basis, even though the Ebola virus is believed to be transmitted via wild animals. Many vendors at the market, who did not want to reveal their identities to ABC News, do not believe Ebola is real, or as a serious as they’re told. 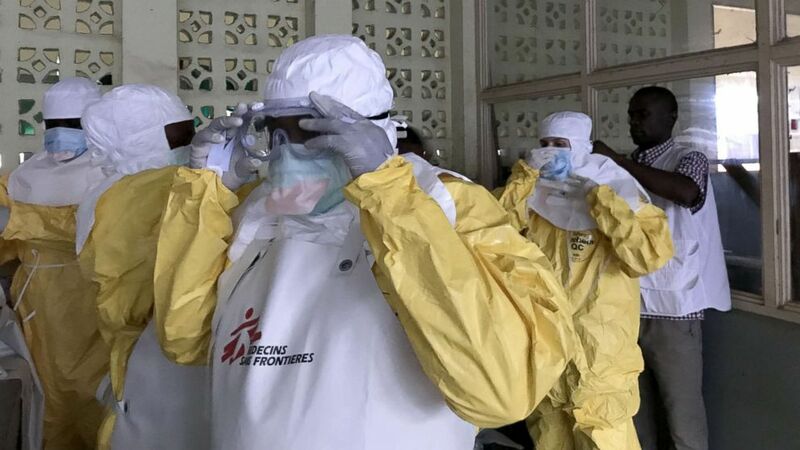 In the capital Kinshasa, authorities say they are accustomed dealing with health emergencies and have expressed confidence in their ability to contain this latest outbreak. Dozens of international non-profits, including the World Health Organization, have deployed volunteers and experts on the ground. Millions of dollars are being spent to ship specialized medical and sanitary equipment to the country. 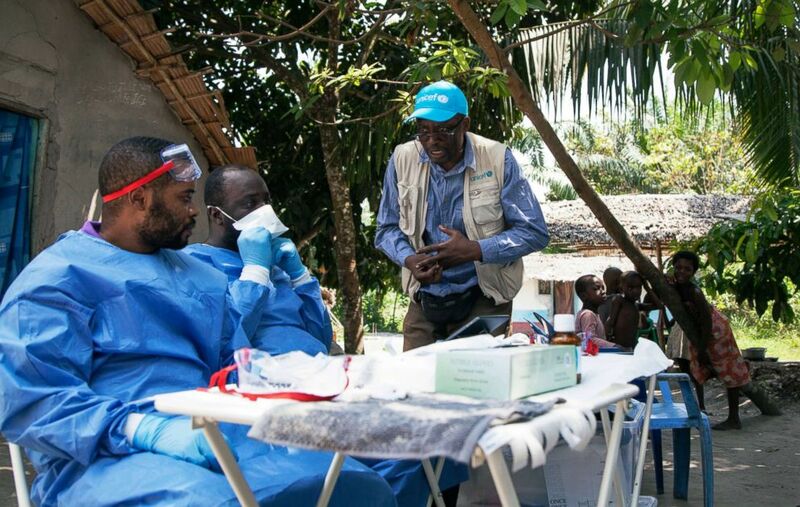 (Mark Naftalin/UNICEF/AP) In this photo taken, May 25, 2018, UNICEF staffer Jean Claude Nzengu, center, talks with members of an Ebola vaccination team as they prepare to administer the vaccine in an Ebola-affected community in the north-western city of Mbandaka, in Congo. In Mbandaka, Edunga Aime is a principal at Ikembo Bobiladawa school. With the help of UNICEF and OXFAM, he’s set up a strict protocol to monitor his students. "Every morning they have to wash their hands with theses chlorine dispensers and we take their temperature," Aime told ABC News. "We do the same before they go back home." Monitoring the population is the current priority for health officials. Teams are going door to door to identify anyone who has been in contact with a person who has had either a confirmed or suspected case of Ebola. The aim is to offer the vaccine all those who are potentially at risk.